Mexico's health secretary said Sunday the swine flu epidemic in his country 'is in its declining phase,' but stressed that people should remain vigilant against the disease. Health workers prepare to fumigate against swine flu at a subway station in Mexico City on Saturday. ((Rodrigo Abd/Associated Press))Mexico's health secretary said Sunday the swine flu epidemic in his country "is in its declining phase," but stressed that people should remain vigilant against the disease. Jose Angel Cordova said his country's death toll from the swine influenza A/H1N1 virus stands at 22 and the number of confirmed cases has increased to 568 from 506, including the dead. Also Sunday, Mexican President Felipe Calderon denounced some countries for taking discriminatory measures against Mexicans because of the swine flu epidemic. "Some countries or places are taking discriminatory measures because of ignorance and misinformation," Calderon said in an interview broadcast on state television. He did not single out any country. 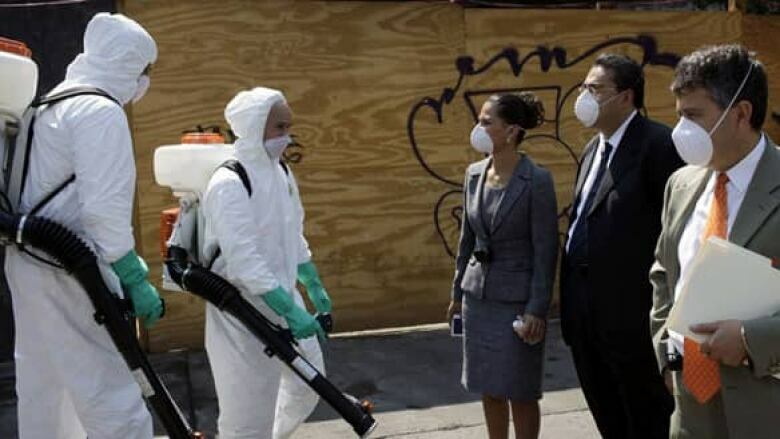 But Mexico's ambassador to China says the Asian country has quarantined more than 70 Mexican travellers in hospitals — including some with no symptoms of swine flu. A Foreign Relations Department official said Mexico will send a plane to China to bring back citizens who wish to leave. The number of cases worldwide reached at least 1,000 in 18 countries, including the first confirmed case in Colombia — with the vast majority of infections in Mexico, the U.S. and Canada, global health officials said Sunday. In a statement, World Health Organization spokesman Gregory Hartl warned that it's not unusual for viral outbreaks to decrease in size before increasing. "I would like to also remind people that in 1918, the Spanish flu showed a surge in the spring and then disappeared in the summer months, only to return in the autumn of 1918 with a vengeance, eventually killing 40 to 50 million people," he said at a news conference in Geneva. Hartl said it's possible health officials could see a decline in swine flu numbers over the summer in the Northern Hemisphere, followed by an increase when colder weather returns. "So I think that while tracing these kind of curves of activity — increase and decrease in activity — we cannot lower our guard," he said. WHO spokesman Dr. Peter Embarak said it's "not a big surprise" that the same strain of swine flu that has made people sick in several countries has been detected in part of a 2,200-head pig herd in central Alberta. Officials on Saturday said the pigs probably contracted the infection from a farm worker who recently returned from Mexico. The farm is under quarantine. The number of pigs infected and the exact location of the farm have not been disclosed. "It's necessary to re-emphasize that this is not a food-borne disease. You don't get this through eating pork, and therefore there is no reason to be afraid of consuming pork products as long as the pork is cooked," Embarak said. Nevertheless, China is halting imports of Alberta pork, according to the official Chinese news agency. Xinhua attributed the information to China's General Administration of Quality Supervision, Inspection and Quarantine and the Ministry of Agriculture. Dr. Brian Evans, executive vice-president of the Canadian Food Inspection Agency said, "With all the factors at play, I would have no issue eating pork from these pigs." Jurgen Preugschas, chairman of the Canadian Pork Council, said there is no danger to the public in eating pork. "We have to understand that this is not a food safety issue but it is a human health issue and that it is safe to eat pork." The U.S. government said it will not impose any trade restrictions on Canadian pork over the infected pigs and will wait for further test results before considering any action. The caseload in Canada has jumped from 51 late last week to 101, with all those afflicted reporting relatively mild symptoms. Nova Scotia has the highest number of cases at 33. Eleven of the new cases were at King's-Edgehill, a private school in Windsor, N.S., that has been the centre of the outbreak in the province. A group of students from the school visited Mexico last month. More cases of swine influenza A/H1N1 have also been reported in Europe. The Spanish health ministry on Sunday said the country now has 40 confirmed cases, making it the European nation hardest hit by the virus. Spanish health officials said most of the sufferers have already recovered. All but two had recently visited Mexico. In China, more than 70 Mexican tourists were quarantined in hospitals and hotels, and Mexicans on arriving flights were isolated, Mexican Ambassador Jorge Guajardo said. Even the Mexican consul in Guangzhou was briefly held after returning from a vacation in Cambodia, Guajardo said. Several Canadian students travelling in Beijing were quarantined at a university simply because they're Canadian and were told they couldn't leave for a week. Food is being delivered to them and doctors visit them once a day, one student told CBC News in an email. In Hong Kong, the government has ordered 350 guests and employees of the Metropark Hotel to remain isolated inside the hotel for seven days. The order was issued Friday after the government said a Mexican man who stayed there had the swine flu virus. The Taipei Times in Taiwan reports many guests are angry with the decision because they were initially told they would only be quarantined for 24 hours. In Trinidad, crew members aboard a Mexican tanker have been isolated since Friday at the Point Lisas port. The Ministry of Health said Sunday they were tested and cleared of any flu infection and the vessel is expected to be released.